ah so great! well done. i love ones with water in particular. so fun to imagine small rivers haha. 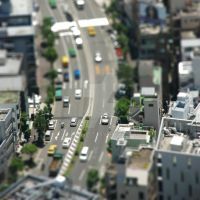 Tilt-shift! ^_^ I love tilt-shift. excellent result ... t-s technique worlks well with the "right" pic/subject ,... you nailed it girl! i took this shot a few years ago up the rialto towers i think thats how you spell it lol but it is no longer open for observation they turned it into a resturant. oh I see, well, if that's the case I should probably scout around Melbourne for other alternative places, thanks anyway! tilt shift is so awesome! Hi Dani. You are featured in this [link] . Looks like some toy train landscape. Oh dear, you do also Tilt-Shift! I looooove this technique, it's so intriguing! Excellent! perfectly balanced, not too much, yet enough to get the effect. i was checking out that ted's competition you are in and came across this one again. i love it and i hope it's okay but i submitted it to the group. i love this one. the buildings to the left of the inchworm looking train are very cool. good stuff! A breathtaking atmospheric shot. Especially the colors have been worked fine out. how did u do that! that worked perfectly! nicely done! Incredible! I love the TS effect here. Well done.